Club tryout is the best way for families to experience the differences between clubs in the form of club culture, philosophy, training approach, ethical principles and compliance. Our tryout philosophy: HONEST; OPEN; FAIR! 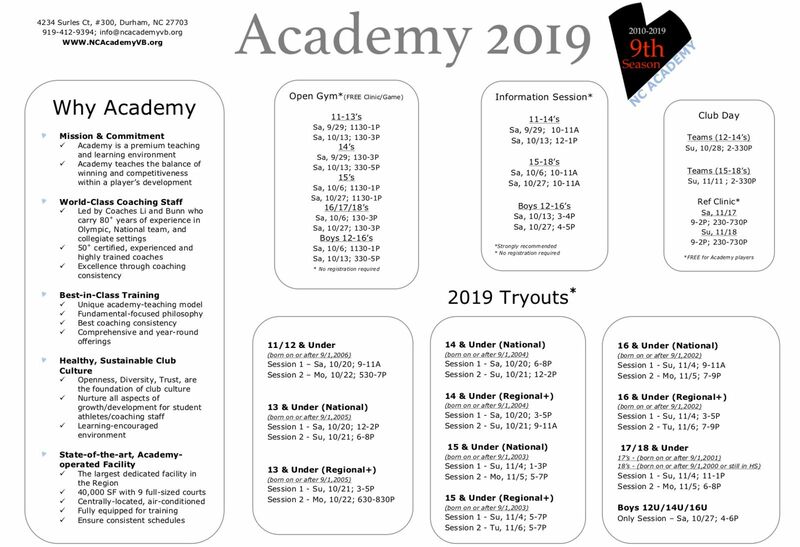 ♦ Open Gym - Opportunities(Free of Charge) to our prospective players to experience Academy's training approach and club culture. ♦ Parent Session - Chance for parents to meet us in person for questions. ♦ Key Dates - Important dates/time that you cannot miss during tryout and post-tryout period. ♦ Coach Assignment - Coaches assigned to specific teams by age groups. • If you tryout for more than one age/level group, additional registration is required. • We then determine team selection and make offers by the level of team. It is important to attend the first sessions if you target on the national teams.